I've been doing this for more than fifty years. Ice storms are my least favorite type of weather and the most difficult to forecast. 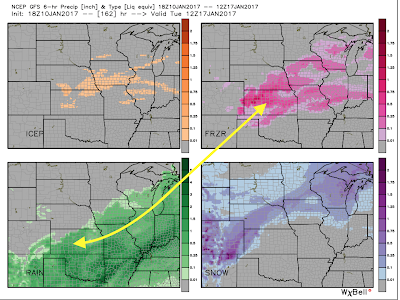 Yet, because of the very high impact nature of ice storms, a quality forecast is essential. The above shows ice pellets/sleet (upper left), freezing rain (glaze ice, the worst kind, upper right), rain (lower left) and snow (lower right). While there are ice storms that occur when the temperature is continuously below 25°, that is unlikely in this case. Especially over southern Kansas, temperatures will hover in the low to mid-30s. 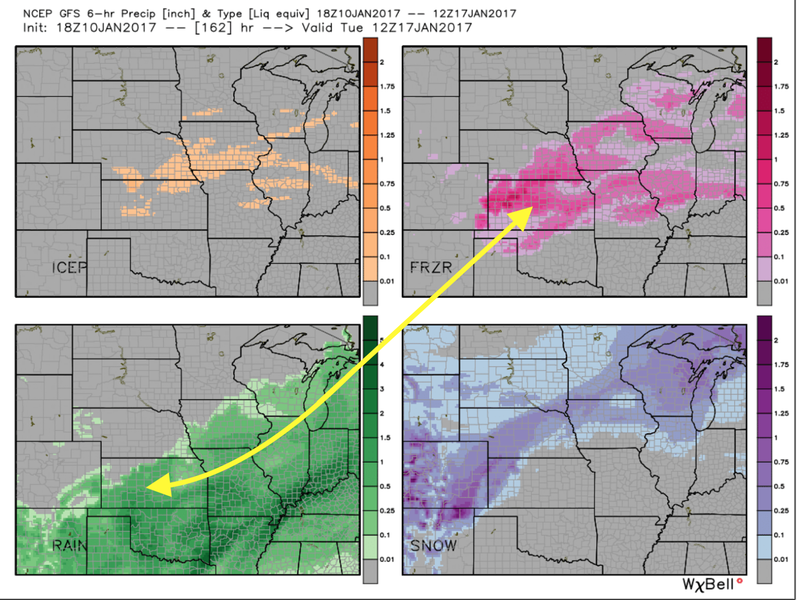 So, there will be periods of freezing rain and periods of liquid rain (note the arrows pointing to the same geographic location). We will be asked by many clients, "How much ice will accumulate on trees and power lines?" That question is hard enough to answer when temperatures are continuously below freezing but nearly impossible when there will be liquid rain to "wash off" the glaze ice. So, that is my best advice for now. Thanks for the update! We took advantage of the nice afternoon today in Hutch and test started/ran the generator. We will get our fuel tomorrow. People need to make sure not to run the generator in the house/garage, or near an open window if outside. Stay safe everyone!